Peppers are a warm weather plant. Flowers will drop from the plant if temperatures are over 85 degrees. Harvest first peppers promptly to stimulate further fruit production. Colored peppers generally require 2-4 weeks to fully ripen. Available in a 4 inch cowpot. All plants are certified organic. California Wonder is a reliable variety for short seasons. 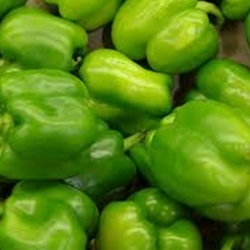 The plants produce blocky, thick walled green peppers. Plants are upright and strong. The fruits will turn a glossy red if allowed to ripen fully. VERY HOT !!! Avg. 2" x 1 1/4", wrinkled fruits ripen from dark green to salmon orange. This extremely pungent habanero may be used fresh or dried. Key ingredient in Jamaican "jerk" sauces. Yellow hot pepper with 5 1/2" x 1 1/2" smooth, waxy fruits tapering to a point. Easy to stuff and to peel after roasting; thick-fleshed for frying. Its sunset-ripening peppers change from yellow to orange to red, and make the prettiest pickled peppers. Definitely, but not overly, hot. High yields of flavorful fruits with distinctive jalapeno flavor. Small, moderately spicy fruits with thick walls are traditionally harvested dark green but can be allowed to ripen to red. A classic eaten fresh or pickled with Mexican dishes! Compact plants are sturdy and work well in containers. California Wonder Yellow has high yields of deep gold, thick-walled fruits that set well in cool conditions. Sturdy, upright 22-30" plants are everbearing until frost.